The first thing we do is try to figure out what went wrong. When people in organizations evaluate poor outcomes, determining what went wrong and why is one of the first steps. Once we have a cause, whether accurate or (often) not, we distribute this information around the organization with the hopes that the knowledge of why we made a mistake will prevent us from repeating that mistake. We attempt to eliminate the mistake from happening again. We hate errors and we make every effort not to repeat them. Here’s an idea that I’ve been toying around with recently — we can’t repeat the same error twice, in part because things are always changing. The river changes and so does the person. Evolution is blind to failure. Evolution doesn’t have intent. When the DNA copy of a species creates a variation—say a shorter beak or sweeter taste—it does so without realizing these traits might have been tried before. These traits are not purposeful; evolution is blind to previous failures and cares not whether a mutation that failed 8 years ago occurs again. This is not a conscious process. What failed to become an advantaged trait two generations ago may become one today. It may be that the environment changed, and where there was once a preference for a shorter beak, a longer one now offers an advantage, however slight. By repeating errors, evolution adapts. This is why natural selection works. 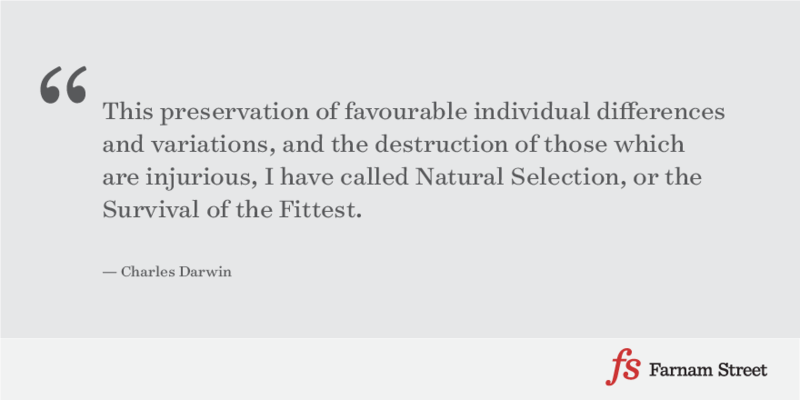 Artificial selection, on the other hand, makes us fragile because selection isn’t blind anymore. So why do we fail. One of the reasons for failure is our own ignorance. These things are within our grasp but we are not quite there yet. Human knowledge grows by the day. Knowledge in this case can be positive ‘what works’ and negative ‘what doesn’t work.’ For example, we can now build skyscrapers hundreds of stories; this knowledge didn’t exist 100 years ago. Thanks to computers and technology we can now model more variables, and we’re better able to predict the weather. The same water doesn’t cross your foot. The world is always changing. What used to be a tailwind is now a headwind and vice versa. We can excuse ignorance, when we only have limited understanding, but we cannot excuse ineptitude. Failures when the knowledge exists and we act contrary to it, become hard to forgive. This is important in the context of organizations because we tend to forgive someone who makes a ‘mistake’ for the first time but punish the person who makes the same ‘mistake’ again. This is a form of artificial selection. I’m not trying to say learning from mistakes is bad, only that it is limited (and a form of artificial selection). It’s a piece to the puzzle of knowledge. But if your process for learning from mistakes doesn’t account for changing knowledge/technology and environments you have a blind spot. Things change. Improving our ability to learn from mistakes involves more than simply determining what went wrong and trying to avoid that again in the future. We need a deeper understanding of the key variables that govern the situation (and their relation to the environment), the decision making process, and our knowledge at the time of the decision. Sometimes it’s smart to attempt things without knowledge of previous mistakes and sometimes it’s not. The first intuition pump is on mistakes. More specifically, how to make mistakes and the keys to good mistakes. The history of philosophy is in large measure the history of very smart people making very tempting mistakes, and if you don’t know the history, you are doomed to making the same darn mistakes all over again. Evolution is one of the central themes of this book, as all my books, for the simple reason that it is the central, enabling process not only of life but also of knowledge and learning and understanding. If you attempt to make sense of the world of ideas and meanings, free will and morality, art and science and even philosophy itself without a sound and quite detailed knowledge of evolution, you have one hand tied behind your back. … For evolution, which knows nothing, the steps into novelty are blindly taken by mutations, which are random copying “errors” in DNA. The chief trick to making good mistakes is not to hide them — especially not from yourself. Instead of turning away in denial when you make a mistake, you should become a connoisseur of your own mistakes, turning them over in your mind as if they were works of art, which in a way they are. The fundamental reaction to any mistake ought to be this: “Well, I won’t do that again!” Natural selection doesn’t actually think the thought; it just wipes out the goofers before they can reproduce; natural selection won’t do that again, at least not as often. Animals that can learn—learn not to make that noise, touch that wire, eat that food—have something with a similar selective force in their brains. 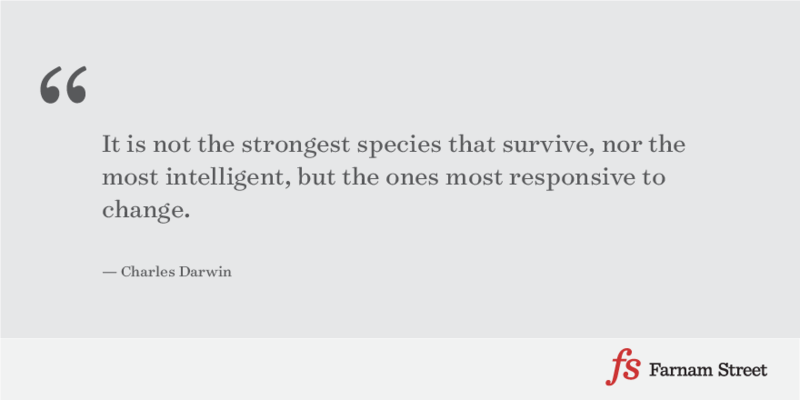 (B. F. Skinner and the behaviorists understood the need for this and called it “reinforcement” learning; that response is not reinforced and suffers “extinction.”) We human beings carry matters to a much more swift and efficient level. We can actually think the thought, reflecting on what we have just done: “Well, I won’t do that again!” And when we reflect, we confront directly the problem that must be solved by any mistake-maker: what, exactly, is that? What was it about what I just did that got me into all this trouble? The trick is to take advantage of the particular details of the mess you’ve made, so that your next attempt will be informed by it and not just another blind stab in the dark. We have all heard the forlorn refrain “Well, it seemed like a good idea at the time!” This phrase has come to stand for the rueful reflection of an idiot, a sign of stupidity, but in fact we should appreciate it as a pillar of wisdom. Any being, any agent, who can truly say, “Well, it seemed like a good idea at the time!” is standing on the threshold of brilliance. We human beings pride ourselves on our intelligence, and one of its hall marks is that we can remember our previous thinking, and reflect on it—on how it seemed, on why it was tempting in the first place, and then about what went wrong. So when you make a mistake, you should learn to take a deep breath, grit your teeth, and then examine your own recollections of the mistake as ruthlessly and as dispassionately as you can manage. It’s not easy. The natural human reaction to making a mistake is embarrassment and anger (we are never angrier than when we are angry at ourselves), and you have to work hard to overcome these emotional reactions. Try to acquire the weird practice of savoring your mistakes, delighting in uncovering the strange quirks that led you astray. Then, once you have sucked out all the goodness to be gained from having made them, you can cheerfully set them behind you, and go on to the next big opportunity. But that is not enough: you should actively seek out opportunities to make grand mistakes, just so you can then recover from them. Every organism on the earth dies sooner or later after one complicated life story or another. How on earth could natural selection see through the fog of all these details in order to figure out what positive factors to “reward” with offspring and what negative factors to “punish” with childless death? Can it really be that some of our ancestors’ siblings died childless because their eyelids were the wrong shape? If not, how could the process of natural selection explain why our eyelids came to have the excellent shapes they have? Part of the answer is familiar: following the old adage: “If it ain’t broke, don’t fix it,” leave almost all of your old, conservative design solutions in place and take your risks with a safety net in place. Natural selection automatically conserves whatever has worked up to now, and fearlessly explores innovations large and small; the large ones almost always lead immediately to death. A terrible waste, but nobody’s counting. Our eyelids were mostly designed by natural selection long before there were human beings or even primates or even mammals. Here is a technique that card magicians—at least the best of them—exploit with amazing results. (I don’t expect to incur the wrath of the magicians for revealing this trick to you, since this is not a particular trick but a deep general principle.) A good card magician knows many tricks depend on luck—they don’t always work, or even often work. There are some effects—they can hardly be called tricks—that might work only once in a thousand times! Here is what you do: You start by telling the audience you are going to perform a trick, and without telling them what trick you are doing, you go for the one-in-a-thousand effect. It almost never works, of course, so you glide seamlessly into a second try, for an effect that works about one time in a hundred, perhaps. When it too fails (as it almost always will) you slide into effect #3, which only works about one time in ten, so you’d better be ready with effect #4 which works half the time (let’s say), and if all else fails (and by this time, usually one of the earlier safety nets will have kept you out of this worst case), you have a failsafe effect, which won’t impress the crowd very much but at least it’s a surefire trick. In the course of a whole performance, you will be very unlucky indeed if you always have to rely on your final safety net, and whenever you achieve one of the higher-flying effects, the audience will be stupefied. “Impossible! How on earth could you have known that was my card?” Aha! You didn’t know, but you had a cute way of taking a hopeful stab in the dark that paid off. By hiding the “error” cases from view, you create a “miracle”. Evolution works the same way: all the dumb mistakes tend to be invisible, so all we see is a stupendous string of triumphs. For instance, the vast majority — way over 90 percent — of all the creatures that have ever lived died childless, but not a single one of your ancestors suffered that fate. Talk about a line of charmed lives! One big difference between the discipline of science and the discipline of stage magic is that while magicians conceal their false starts from the audience as best they can, in science you make your mistakes in public. You show them off so that everybody can learn from them. … It is not so much that our brains are bigger or more powerful, or even that we have the knack of reflecting on our own past errors, but that we share the benefits that our individual brains have won by their individual histories of trial and error. I am amazed at how many really smart people don’t understand that you can make big mistakes in public and emerge none the worse for it. Actually, people love it when somebody admits to making a mistake. All kinds of people love pointing out mistakes. Generous-spirited people appreciate your giving them the opportunity to help, and acknowledging it when they succeed in helping you; mean-spirited people enjoy showing you up. Let them! Either way we all win.